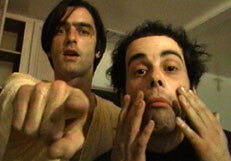 uffering or recovering Rock-Star wannabes will be amused, entranced and maybe ashamed by Ondi Timoner's documentary, "DiG!," which chronicles the changing fortunes of a Bay Area musical-miscreant band, the Brian Jonestown Massacre, and its vastly more successful Portland little brother, the Dandy Warhols. "DiG!" 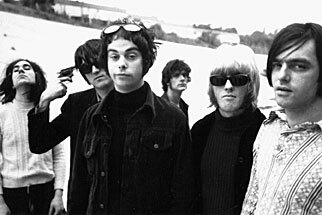 at first appears to be a simple documentary of the troubled psychedelic rock band, BJTM (in rock-crit shorthand), led by crazy genius Anton Newcombe. "DiG! ": righteous rockers or deluded fools? Newcombe possesses skills to churn out beguiling if not derivative (note the apropos mutton-chops-and-flares name-check in the band's moniker) folksy space-rock at a frightening pace. His music is rooted in the tradition of LSD-scarfing San Fran musos of past decades and, like any good guru, he's able to convince like-minded players to buy into his vision  enough so to inspire this documentary. He's even so devoted to the psycho-delic cause that he introduces Timoner to another emerging band of similar ilk  the Dandy Warhols. While Newcombe's move sparks a truly fascinating, overwhelming picture (one that took seven years to create), it may have been a mistake. Lay back and watch Newcombe's fascinating, self-destructive, self-defeating behavior. Meanwhile the Dandies take over the world (well, Europe, anyway). 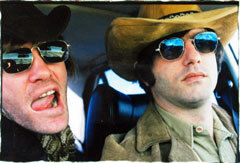 It's hard to tell who's the more righteous rocker (or deluded fool) in "DiG!" Is it Jonestown's alcoholic enfant terrible Newcombe, the fisticuff-favoring front man who'd rather beat the crap out of his bandmates on stage than approach the possible corruption of success? Rock Stardom: What's it all about? Or is it fop-about-town, cruelly talented Courtney Taylor-Taylor? He's the Dandy's engine-that-could, a guy who (perhaps arrogantly, yet empirically) states he can sneeze out pop songs that will hypnotize even the staunchest anti-hipster. While the success-phobic Newcombe (perhaps subconsciously) avoids monetary legitimization of the arrested adolescence we call Rock Stardom, in the end we ask: "What's it all about?" Is it really just about the music, about Newcombe's ability to record five albums in one year, or is it about fully buying into a righteous but untenable bad-boy image fueled by self-hate? On the other side, what happens when you become a money-making machine founded on the same Dionysian myth? What happens when the hundreds of thousands who adore you  as Taylor-Taylor intimates  demand you continue fulfilling their fantasies of arrested adolescence while remaining fresh, new and sane? How do you keep it real, man? "DiG!" can't provide any real answers. It can only start to tell Newcombe's story and then watch out as he's steamrolled by his "favorite new band," which massively eclipses him in success. Perhaps the only lesson comes from mysterious BJTM member Joel Gion  the diffident, rakish tambourine player  who calmly observes the proceedings, comments wryly (while stealing the show from everybody with his affable good nature), then celebrates his own post-BJTM success. He gets his own apartment, a good job at Amoeba records and the honor of recording a commentary track on the DVD. Keeping it real: Is it just about the music? Though it (embarrassingly) took me until the recent excellent two-disc release of the movie to actually see it, I'm certainly amused and enraptured at how Timoner's warts-and-all documentary captures the enduring, confounding allure of Rock Stardom. "DiG!" is thrilling for pedestrian viewers and lovers of pop music. It may also be depressing, disillusioning, empowering or deluding, depending on where you find yourself in the Rock-Star food chain.